Now it is official. India has succeeded in securing a civilian nuclear cooperation agreement with the US in accordance with the commitments made in the July 18, 2005, and March 2, 2006, joint statements signed by Prime Minister Manmohan Singh and President George W. Bush. THE 53-day-old Digambar Kamat government in Goa is on the verge of collapse. It was reduced to a minority on Thursday following the withdrawal of support by the two-member Maharashtrawadi Gomantak Party, a Congress member and an Independent. Will the military-ruling party tussle end? Turkish Prime Minister Recep Tayyip Erdogan’s Justice and Development Party (popularly known as the AKP), which has an Islamist past, was returned to power with an improved majority in Sunday’s parliamentary elections, considered most crucial in the country’s post-World War history. The 123 Agreement between India and the US has been finalised and frozen, pending its being further processing. India has to conclude a safeguards agreement with the International Atomic Energy Agency (IAEA) and thereafter obtain the necessary clearance from the 45-member Nuclear Suppliers Group (NSG). Then the agreement will be presented to the US Congress by the President for its formal approval. FIRST impression may not be the best impression. This was literally true in the case of Dalbir Singh, Deputy Editor of Punjabi Tribune. A couple of times I bumped into him in the office premises, he did not acknowledge my wishes, let alone reciprocate them. India would have had its first woman Head of State three decades ago — in 1977 — if Morarji Desai had his way. Dr. Rukmini Devi Arundale, a famous Bharat Natyam exponent and architect of Kalakshetra of Adyar in today’s Chennai was his choice. Every man over 50 should be offered a pill to cut their risk of a heart attack, according to the Government's heart tsar.Mass medication of the population would be the best way of cutting Britain's high rate of deaths due to cardiovascular disease, which claims more than 200,000 lives a year, said Roger Boyle, the National Director for Heart Disease. The first woman President of the country, Pratibha Patil, was sworn in last week, which makes Indian women very proud. Americans are still not too keen or ready for a woman President. And hence their reservations about Hillary Clinton. Now it is official. India has succeeded in securing a civilian nuclear cooperation agreement with the US in accordance with the commitments made in the July 18, 2005, and March 2, 2006, joint statements signed by Prime Minister Manmohan Singh and President George W. Bush. Even Atomic Energy Commission Chairman Anil Kakodkar, who had earlier expressed reservations, is satisfied with the text of the 123 Agreement. If he says “I would describe this (agreement) as satisfactory from the point of view of carrying forward our nuclear programme” nobody should have any reason to feel unhappy. This assurance should be accepted by the sceptics. Dr Kakodkar being one of the key negotiators from the Indian side in Washington has, in fact, made it easier for Dr Manmohan Singh to make the deal acceptable to Parliament and to the country. So far as the fears associated with the provisions in the Hyde Act were concerned, the three top Indian negotiators — Foreign Secretary Shivshankar Menon, National Security Adviser M. K. Narayanan and Dr Kakodkar — made it plain at their Press conference last Friday that the fuel supply assurances as given in the March 2006 joint statement covered the termination of the cooperation in the event of India conducting a nuclear test. In any case, nothing will happen abruptly and without consultations between India and the US. Reports from Washington suggest that the language used in the final text of the 123 Agreement has been kept “deliberately vague”, but this should not worry India. The Bush administration is yet to get the ultimate seal of approval from the US Congress. Such stories may obviously be aimed at satisfying the nonproliferation lobbies in the US. Often the negotiators work out agreements that can be interpreted to the satisfaction of both sides, enabling them to get over legislative objections. The Indo-US deal is a step forward for India as it opens the door for the latest nuclear technology for the country. India’s record as a responsible nuclear-weapon state has helped it in getting this the deal from the US, which also gains from the emerging relationship between the two countries. With the US on India’s side, hopefully, there is going to be no difficulty in reaching a safeguards agreement with the International Atomic Energy Agency and getting the nod from the Nuclear Suppliers Group for nuclear fuel supplies needed for a series of reactors India wants to set up to meet its growing energy requirement. India can now have access to sensitive nuclear technology that was being denied to it by the US and some other Western countries. THE 53-day-old Digambar Kamat government in Goa is on the verge of collapse. It was reduced to a minority on Thursday following the withdrawal of support by the two-member Maharashtrawadi Gomantak Party, a Congress member and an Independent. Thus, in the 40-member Assembly (one seat belongs to the Speaker), the ruling coalition has only 19 members against the Opposition’s 20. The elections held in June failed to provide a stable government because of the culture of defections that prevails in this small state. From day one, the Chief Minister had been finding it difficult to run the government, which enjoyed only a wafer-thin majority. There were many claimants for ministerial berths, including Ms Victoria Fernandes of the Congress who has quit the party. The allies, too, have been breathing down Mr Kamat’s neck to extract their pound of flesh. Earlier, the government received a jolt when it failed to have a Finance Bill passed in the Assembly. Even as the BJP-led new front — the Goa Democratic Alliance —led by former Chief Minister Manohar Parrikar, has staked its claim to form the government, the Speaker, Mr Pratapsinh Rane, has tried to help the ruling coalition by adjourning the Assembly till Monday. This has raised apprehensions about the ruling party’s desperate attempt to cling on to power by engineering defections from the rival camp. Since the Assembly is in session, there should be no problem for the Chief Minister to prove his majority on the floor of the House. This is a must because of the doubts raised about his majority support. Ideally, the Chief Minister should have proved his majority on Thursday itself. In view of the claims and counter-claims, he should prove his majority in the Assembly when it meets on Monday. Any other course will be patently unconstitutional. Governor S.C. Jamir has already said that he will be guided by the Constitution. With the earlier crises in Goa and Jharkhand fresh in people’s memory, the Governor’s actions will be on the scanner again. Finally, whoever wins this round of musical chairs, Goa is in for yet another bout of political instability. Turkish Prime Minister Recep Tayyip Erdogan’s Justice and Development Party (popularly known as the AKP), which has an Islamist past, was returned to power with an improved majority in Sunday’s parliamentary elections, considered most crucial in the country’s post-World War history. The AKP still lacks an absolute majority to get its presidential candidate approved by parliament automatically, but its victory is unprecedented because no ruling party in Turkey has ever improved its electoral performance so spectacularly. The polls were held four and a half months early in the wake of the crisis that arose when the army-led secular establishment charged the AKP with clandestinely trying to implement an Islamist agenda by fielding Foreign Minister Abdullah Gul as a presidential candidate. Mr Gul is a practicing Muslim and hence not acceptable to the secularists. Voters have given their mandate to the AKP for a second time primarily because of the Erdogan government’s performance on economic and other fronts since it captured power in 2002. The Turkish economy has never done as well it is doing now with a 7 per cent growth rate recorded last year. Foreign direct investment has increased to a record level. The economic boom has led to inflation coming down considerably. The government has been enthusiastically pursuing economic and political reforms. Prime Minister Erdogan’s determined efforts for joining the European Union have earned him accolades from within Turkey and elsewhere in Europe. Mr Erdogan is now certainly reform-oriented, but his problem is that the army, functioning as the guardian of Turkey’s secular constitution, does not trust him fully because of his Islamist past. The army has allowed him to run the government so far, but it has doubts about his real intentions despite his repeated promise that he will do nothing that can undermine the secular constitution designed to promote the ideals dear to modern Turkey’s founder, Mustafa Kemal Ataturk. Will Mr Erdogan’s tussle with the military end after his electoral victory? It is difficult to say anything at this stage, but he may have to drop the idea of nominating his controversial Foreign Minister as the ruling party’s candidate for the coming presidential election in the interest of peace and stability in Turkey. This agreement has taken two years and two days to conclude since the signing of the Joint Statement on the enhancement of Indo-US relations by the Prime Minister of India and the President of the US on July 18, 2005. When compared to similar agreements on civilian nuclear cooperation involving reprocessing rights (signed by the US with Japan, Euratom and Switzerland) this is the fastest negotiation. This has come about in spite of prophets of doom and gloom predicting that India would not be able to conclude an agreement that would fulfil all the pledges given by the Prime Minister to Parliament on August 17, 2006. Even recently some of our retired scientists had recorded their reservations on India being able to secure all its objectives and yet allow the US side to fulfil its obligations under the Hyde Act. The conclusion of the agreement proves that where there is a will, a way can always be found to sort out problems. The Chairman of the Atomic Energy Commission, who had earlier voiced his reservations in public on his perception that the US side was shifting the goalposts, has now expressed full satisfaction with the agreement. This will not be the end of the debate on the agreement. Some Opposition parties, analysts and media men will feel that they will be failing in their duty if they do not find fault with the agreement. That kind of opposition in a democracy is healthy and needed. In fact, such domestic criticism helps our government negotiators in their tough negotiating exercise with foreign interlocutors. As National Security Adviser M K Narayanan pointed out, the Indian side could tell the US negotiators that they had no flexibility left in view of the pledges made to Parliament and, therefore, India expected greater flexibility from the US. After making this point it is necessary to understand why this agreement came about and why so many of our analysts went wrong. This is not just an agreement between India and the US. If that were so there was no need for other steps involving the IAEA and the NSG before the agreement goes before the Congress. This is an agreement involving the entire non-proliferation regime and acceptance of India as part of the non-proliferation regime though not of the Non-Proliferation Treaty. Those who see all kinds of US conspiracies to entrap India must explain whether in their view there is an international conspiracy against India involving 45 members of the NSG, including China and Russia. When President Bush was asked during his Press briefing at Hyderabad House on March 2, 2006, why India was being rewarded by being exceptionalised from the NPT even as it had violated the treaty, he replied, "what this agreement says is things change, that the leadership can make a difference and telling the world, sending the world a different message from that which is what used to exist in people's minds." The world has changed in the last 20 years. India and Pakistan have conducted nuclear tests, survived the international sanctions and have pre-1998 type of relations with the rest of the world. China has nearly $300 billion trade with the US with $230 billion in its favour, Russia has become a major energy exporter and has close relations with Europe, Japan and China. The US finds itself a very constrained military power unable to prevail even against middle powers such as Iraq and Afghanistan. India is growing at an 8 per cent annual rate and is expected to become the fourth or fifth largest market in the world. There are no military blocs in the world aligned against each other and there is a recognition of a six-member balance of power with very little expectation of a war among them. The balancers are the US, the European Union, China, Japan, Russia and India. Nations of the world are adjusting themselves to this new situation. No doubt, each major player is attempting to augment its national interest through it partnerships with others.The US, having been the pre-eminent power in the international system for the last 60 years, intends to keep it that way. India today, unlike in the pre-nineties era, is a meaningful economic player and is recognised as having the potential to rise further. Therefore, the US, Russia and the European Union are keen on partnerships with India. In a globalised world, a growing India is in the interest of all major powers. Of all major powers, the US has a particular interest in India, having benefited from the Indian diaspora and from off-sourcing R&D in many fields to India. This is a world different from the one during the Cold War era. There are, however, people with Cold War mindsets both in India and the US who nurse enormous distrust about each other. Such people tend to be more articulate than the new generation of people free of Cold War prejudices. This does not mean that the US has given up its ambitions of being the most dominant world power or China the most dominant Asian power. But the world has changed and nations have to adjust themselves to it. The move to lift technological apartheid against India is one of those inspired by national interests of other major powers. While the Bush administration, in its own national interest, has been pushing for it, other major powers have an equal interest in it. It is up to us to exploit it and not throw away the opportunity, still nursing memories of old grievances. Some upstarts have a problem in wishing their colleagues who, they think, are inferior to them but that could not have been the case with Dalbir Singh, who was an amiable person. The thick glasses he wore were an indication that his eyesight was not great. I realised the gravity of the problem only when we travelled together to Bathinda on an unpleasant task of inquiring into the misconduct of a stringer. After the work was over, we decided to visit Talwandi Sabo where Guru Gobind Singh had dictated a large chunk of Guru Granth Sahib. Dalbir Singh was as excited as I was about the visit to the gurdwara on our way back to Chandigarh. The sun was at its brightest when we stepped into the main building which was dimly lit. I was busy fiddling with my camera, when I suddenly saw Dalbir Singh prostrating before, possibly, the golak. I did not find anyone else doing so. Was he so religious that he would prostrate before everything in the house of the Guru? How could I ask him such a question? As we moved forward, I noticed that he did not bow before Guru Granth Sahib. I summoned up courage to whisper into his ears that we were about to walk past the sacred Book. “But I have already kneeled before Granth Saheb”, he replied. Realisation dawned on me that he had mistaken the golak for Guru Granth Sahib. Dalbir Singh told me in detail about the historical importance of Talwandi Sabo. On a question on Sukhmani Sahib, he gave me a nice exposition on how Guru Arjan Dev composed it and how its recitation would help the devout. For all his knowledge of Sikhism, it was difficult to believe that he was a communist in his younger days, who believed in the dictatorship of the proletariat. As he took me down memory lane, I became hungry. “Let us go to some restaurant”, I suggested. “I will take you to a restaurant where you will get authentic Punjabi food”, said Dalbir Singh. Little did I know that we would have to travel nearly 30 km to reach that dream restaurant. Finally we reached a small wayside dhaba, whose proprietor recognised him the moment Dalbir Singh stepped out of the car. He came running and gave him a hug. His food may not have been all that “authentic” but he seemed to ooze friendship. “He was a comrade who has fallen on evil days”. The proprietor would not accept any money but Dalbir Singh found a way out. “Had he been a little richer, I would not have paid”. Dalbir Singh had excellent contacts everywhere we went. Many of them were ardent readers of his weekly column. He considered journalism as a battleship in action and he wrote as quickly as events happened. Few people knew that he spent his spare time making wine at home. He had different kinds of the heady stuff in his “cellar”, all made by himself. “That would make an excellent lifestyle story”, I blurted out. “But do you think it is ethical for The Tribune to write on a Tribune staffer?” he queried. “We will not write about Dalbir Singh, the journalist, but we will write about Dalbir Singh, the winemaker”. He reluctantly agreed to be featured in the Lifestyle section. That was Dalbir Singh, who clutched at his pen as he breathed his last in the office on Saturday, aged 58. Clean as a whistle — as they say — without even a breath of taint of cooperative or non-co-operative activities, Rukmini Devi had grown up literally under the shade of a famous banyan tree in the sprawling Adyar campus of the Theosophical Society of India. Her father was a key functionary of the society. The institution conjures up the names of Annie Besant and J. Krishnamurti. Neither gender thrust nor the lure of Bharat Natyam had apparently driven Desai in plumping for Rukmini Devi. He wanted a non-political cultural personality with ethos singularly Indian and ethical and Rukmini Devi filled the bill eminently. He had taken over as Prime Minister after the Janata Party, a conglomerate of the Congress (O) as the rump of the party split by Indira Gandhi in 1970 was called, the Lok Dal of Chaudhry Charan Singh, the Bharatiya Jana Sangh — the forerunner of today’s BJP and the Socialist Party of Madhu Limaye and George Fernandes — won a landslide victory in the 1977 general election in which both Indira Gandhi and her second son, Sanjay, were unseated. As it happened, Desai was unable to prevail upon Rukmini Devi and, more importantly, the party would not go along with him. Madhu Limaye’s argument that an active politician should be the President prevailed and the then Lok Sabha Speaker, Neelam Sanjiva Reddy, was chosen and elected for the top post. Incidentally, Sanjiva Reddy was the only Janata Party MP from Andhra Pradesh and after his elevation the party lost the seat. Worse still, Desai’s apprehension that Sanjiva Reddy in Rashtrapati Bhavan would meddle in the party’s internecine feuding came true. Within 18 months, the combine came unstuck, paving the way for the return of Indira Gandhi to power in 1980. As stated, Desai’s purpose in having a President of his choice was not to reduce Rashtrapati Bhavan to a fiefdom. He was realistic enough to know that it was beyond his ken. But a “co-operative” — not in the banking or farming sense — President could have perhaps enabled his fragile government to last longer. In other words, even if Desai had wanted, he was in no position to be the maker or even prop of the President. This is the qualitative difference between the situation in 1977 and now — three decades later when the party’s hereditary president not only appoints the Prime Minister but also chooses the President. What does it mean for the democratic institutions in India, including the judiciary and civil society? Do the defence services become vulnerable to subornation? Does it augur well for our democratic polity? A more successful Morarji Desai find is Najma Hepatullah. Introducing her as Maulana Azad’s granddaughter, Desai readily made her a nominated member of the Rajya Sabha — which is no small compliment considering his tough standards for nominating persons to the Upper House. For instance, he would not have a journalist like K.R.Sundararajan of the Times of India, Bombay, despite George Fernandes’s pleading. Sundararajan had lost his job and suffered detention during the Emergency. Desai contended that the Constitution did not recognise journalism as one of the trades/professions deserving representation in the Rajya Sabha. He was prepared to make an exception in the case of B.G.Verghese because “he is not a run-of-the-mill journalist”. But Verghese said “no” because he had contested the Lok Sabha election from Kerala and lost! How different from today’s practice of any and every ruling party politician who lost the Lok Sabha election being either ensconced in the Rajya Sabha or made a Governor, and the Rajya Sabha becoming a haven for all and sundry. Indira Gandhi was not only elected to the Lok Sabha but also chosen leader of the parliamentary party. Besides, she was also the party president even if there were no organisational elections. It involved ditching the party’s official nominee, whom she had herself proposed. She had thus unmade Sanjiva Reddy’s presidential prospects in what the victim had lamented as an instance of the fence eating the crop! Replacing Giri, with the unseemly overtones of the Supreme Court adjudication of the election petition against him was child’s play. Indira Gandhi lost no time putting Fakhr-ud-Din Ali Ahmed in Rashtrapati Bhavan in 1974. Another difference from today’s situation was that there was no opposition party in the fray when Indira Gandhi made and unmade Presidents. Thus, when she picked up Giani Zail Singh for the post in 1982 the shadow of Jarnail Singh Bhindranwale in the offing was looming large on the political landscape. She might have, therefore, felt that a Sikh in Rashtrapati Bhavan could be a psychological counter, at the least. The Giani’s reported declaration of his readiness to sweep the floor if “Madame” asked him to was needless rhetoric. Thus, Indira Gandhi was not guided solely by scoring Brownie points. . Her agenda very often was her perception of political interest. Although she had set out to found a political dynasty, she knew the limitations. Thus when there was widespread resistance even during the Emergency to Sanjay succeeding her, she did not persist. But for her dastardly assassination allegedly by her bodyguards and the national disaster it spelt, the transition to Rajiv Gandhi also would not have been so smooth. Today’s situation differs in this respect. The mind of the maker of the President is a closed book. She is not only the maker of the President but also the Prime Minister. How does a person react when both the President and the Prime Minister look up to her with sycophants singing hallelujahs? In the circumstances, it is all the more necessary the new Rashtrapati strives to live up to her stated priorities. Every man over 50 should be offered a pill to cut their risk of a heart attack, according to the Government's heart tsar. Mass medication of the population would be the best way of cutting Britain's high rate of deaths due to cardiovascular disease, which claims more than 200,000 lives a year, said Roger Boyle, the National Director for Heart Disease. But he acknowledged that the public was not yet ready to accept such an approach which would turn millions of "healthy" people into patients and draw accusations of a nanny state. He called for a public debate on the pros and cons of "medicalising" the population by treating millions more people with statins – drugs to reduce cholesterol which are already saving thousands of lives. For women, whose risk is lower, treatment would be offered at the age of 60, he suggested. Statins have been described as wonder drugs because they can reduce the risk of a heart attack or stroke by a third, if the dose used is high enough, and have few side-effects. Three million patients are taking statins in England, which are preventing an estimated 10,000 deaths a year at an annual cost of £550m. Dr Boyle, who takes a statin himself – "the cheapest available" – said that since the mid- 1990s, when Britain was the heart disease capital of the world, the death rate had fallen by 36 per cent, thanks in part to the increased use of statins. "It is not perfect yet but we have seen substantial improvement," he said. "We now need to move on. Despite the reduction in the death rate, cardiovascular disease is still the main cause of death, more than for all cancers combined. We have still got a huge task. We may no longer be the cardiovascular disease capital of the world but in a nation such as ours we ought to be achieving optimal results." Current advice was to offer treatment to anyone with a 20 per cent increased risk of a heart attack over the next 10 years, based on their cholesterol level, blood pressure, weight, smoking and family history. But this involved a huge amount of time and effort by GPs and nurses involved in identifying, interviewing and testing patients at high risk. "You could say once a man reaches the age of 50 he should be offered treatment, because the risk rises over 50," said Dr Boyle. "But I don't think the general public is ready for a get-to-50-and-take-your-tablet approach. At the moment we need to do it on an individualised basis because that is what the public wants. Statins block the manufacture of cholesterol in the liver, lowering the level in the blood and cutting the risk of a heart attack or stroke. The biggest effect is in patients with the biggest reduction in cholesterol, regardless of their starting level – so potentially they could be effective in everyone. Dr Boyle's remarks, at a briefing on statins organised by the Science Media Centre, were rejected by Professor Peter Weissberg, medical director of the British Heart Foundation. "I don't think [the blanket approach] is the right approach at this stage," he said. "It may be right in 10-15 years when we know more about statins. I have always taken a cautious approach to prescribing, The downside with statins is as low as any drug I have seen, but there is still a downside. I favour everyone knowing what their risk [of a heart attack] is and then those at high risk being offered the opportunity to reduce it." Mass medication of the population sounds Orwellian. It turns on its head the principle that medical treatment should be geared to specific risks. But the problem with heart disease is that identifying those at particular risk is extremely difficult. One third of those who have a heart attack have no warning symptoms – and a third of those will die. It may be time, therefore, to discard the idea that risk factors have to be measured and accept that in Western society the risk factors are high in us all, so everyone is at risk. Statins were established as the most effective drugs in the treatment of heart disease more than a decade ago – and 96 per cent of deaths occur in people over 55. Pratibha Patil is known for her composure and strong will. She has won five elections and has been the Deputy Chairperson of the Rajya Sabha and the Governor of Rajasthan. Surely, she must be having some qualities to be able to become the President of the largest democracy of the world. With the President of the country being a woman and the UPA too headed by a woman, India is actually being ruled by womenfolk, it seems. It is amazing that you still hear about foetus abortions and dowry deaths. The women reservation Bill is pending. 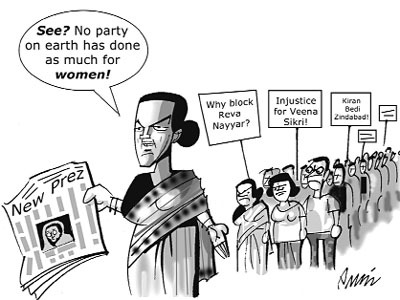 In the Congress women are still not encouraged and given their due. Women in villages may become sarpanches due to their own work and determination. But mental and physical harassment of women is still common in our country. Pardah and Sati are still what India is associated with in the West. Women’s health is a neglected area. Hopefully, the two women at the helm of affairs will work towards the welfare of the girl child and for women's uplift. There will be a temptation to make every issue of promotion or appointment a matter of women's empowerment. Already, Veena Sikri at the MEA and Kiran Bedi at Delhi Police are insisting that they have been discriminated against. But the public will soon have to distinguish between matters such as these and the real issues that women worry about. Yasmin Kidwai had a preview of her documentary on polo. Polo, we always thought, is a game of the royalty. But with the kind of research Yasmin put into this documentary, we realised that polo actually is an old traditional game. It had been played by Manipur locals for over thousands of years. It was a common sport of Ladakh and then it caught the interest of the Maharajas of Patiala, Jodhpur and Jaipur. It is a game which can be highly risky, given the speed of high-bred horses. The documentary captures the last match played by the Jodhpur Maharaja’s son who had a fall two years back and is still recovering. The Army Chief, Gen J. J. Singh, was very impressed with the kind of coverage the documentary gave the Army’s interest in and contribution to polo. After all, the best horses are with the armed forces. A political crowd that included the Haryana Governor and Chief Minister Hooda, along with polo players and enthusiasts sat through the documentary engrossed. It was, no doubt, an event to be remembered as this was the first documentary ever on polo. Delhi's chatterati, Maharani Gayatri Devi and film stars all lend glamour to the polo game played here in winter. There is no dearth of sponsors for players and the game is getting popular among the rich and famous.